From New England Book Award winner Lily King comes a breathtaking novel about three young anthropologists of the ’30s caught in a passionate love triangle that threatens their bonds, their careers, and, ultimately, their lives. English anthropologist Andrew Bankson has been alone in the field for several years, studying the Kiona river tribe in the Territory of New Guinea. Haunted by the memory of his brothers’ deaths and increasingly frustrated and isolated by his research, Bankson is on the verge of suicide when a chance encounter with colleagues, the controversial Nell Stone and her wry and mercurial Australian husband Fen, pulls him back from the brink. Nell and Fen have just fled the bloodthirsty Mumbanyo and, in spite of Nell’s poor health, are hungry for a new discovery. When Bankson finds them a new tribe nearby, the artistic, female-dominated Tam, he ignites an intellectual and romantic firestorm between the three of them that burns out of anyone’s control. The new cuisine that emerged was intended to be as pleasing to the eye as to the palate: it suited sensitive dispositions, the meagre appetites of noblewomen, and was perfectly in tune with the new preference for close-fitting clothes and slimness of figure. Camporesi places these changes in taste and cuisine in their socio-cultural context, including the increasing importance of French cultural models in the world of food and drink, and describes the growing interest taken in the world outside Europe, especially China and the Americas, where most of the exotic additions to the European diet originated. 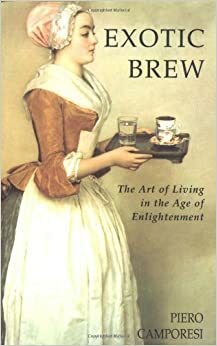 Exotic Brew reconstructs an important chapter in the history of mentalities and taste. It will be welcomed by students and researchers from a wide range of disciplines – social and cultural history, the Enlightenment, the history of medicine – as wellas anyone interested in the history of food and drink.